Edmonton’s 21st DemoCamp took place tonight at the Telus Centre on the University of Alberta campus. DemoCamp brings together developers, creatives, entrepreneurs, and investors to share what they’ve been working on with the local tech community. Tonight’s audience seemed to be filled predominately with first-timers! Opening the show was David Nedohin and Graham from Scope Technologies. They build augmented reality training systems. 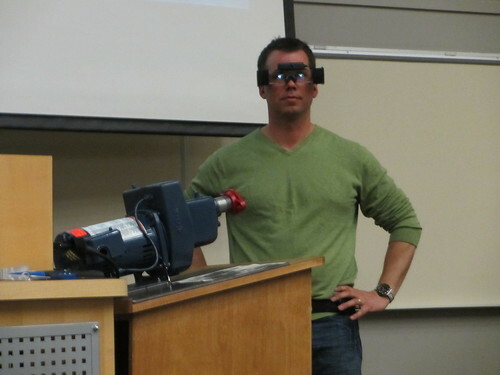 Tonight they demoed a pretty slick augmented reality training app for a pump assembly. Using a pair of Epson Moverio glasses outfitted with a camera, we were able to see everything David saw as he followed the on-display instructions. The app supports three modes: observe (learn what you’re supposed to do), execute (do it), and record (for auditing purposes). It of course drew comparisons to Google Glass, though the key offering here is the 3D overlay training solution, not the hardware. Next up was Nolan Smits who showed us Nutrsync, a project he has been working on for the last nine months or so. After Nolan took a greater interest in his own health, he decided an app to track nutrients would be useful and he set out to build it. Written in PHP with lots of jQuery, it’s a slick looking app even if it is missing a few features still. You can quickly see how much of each nutrient you’ve eaten, and it’ll suggest foods to fill up on the ones you’re missing. For me the biggest challenge is the same as every food-tracking app: unless you’re eating pre-packaged brand name meals or fast food, it’s too much of a pain to input what you’re eating! Third tonight was Ric Williams from Hungry Moose Games who demoed their new effort called 9 Lives: Casey and Sphynx. One of the neat things about Hungry Moose is that it’s a mashup of local talent, including some ex-BioWare guys and Ric who was with Empire Avenue (and was inspired the guys who built Life Goes On, demoed at DemoCamp Edmonton 18). The highlight of the work-in-progress demo was that the game was built with Unity and was running on a Kindle Fire HD, controlled with a Green Throttle Bluetooth controller. “The $60 game and $125 million investment is going the way of the dodo,” Ric told us, explaining the upheaval taking place in the gaming industry right now. Next up was David Quail and Tim Fletcher who demoed Zenlike. They’re hoping to save users time by utilizing machine learning and natural language processing to automate mundane, boring tasks. Their first area of focus is meeting scheduling. You simply CC your “virtual assistant” on an email thread to setup a meeting, and it parses out the details and sets up the calendar entry and invites (kind of like the way TripIt automagically parses out your itinerary). It was really slick to see in action (it’s a combination of Mechanical Turk and algorithms). I look forward to the day when my devices just know what I want to do and do it. The final demo of the evening was from Ben Zittlau and Greg Bell. They showed us a new Mover.io feature called Clonr. The idea is pretty simple: magically move things from one place to another! They’ve decided to focus on WordPress to start, and tonight they demoed the ability to completely move a WordPress site from one server to another with basically a single click. They support DreamHost, 1and1, HostGator, as well as plain old FTP, and they’ll move beyond WordPress to other platforms once they’ve got a bit more functionality in place. There’s a massive market for this kind of thing! It was another solid night of demos, so well done to all the demoers! I think my favorite was probably Zenlike, because I can see the trajectory they’re on and it’s thrilling. I, for one, welcome our new robotic overlords. I think there’s no question that Clonr is going to be a big success for the Mover guys, and I’m looking forward to seeing that tool evolve. Edmonton now has a Python Meetup Group! They’re planning to meet on the second Monday of each month. TEDxEdmonton 2013 is coming up on June 15. Tickets are on sale now, and some of the presenters have been announced! Ready to build something? Startup Weekend returns to Edmonton on April 26. I hope you see you on Friday at the new Intersect event, billed as a collision of artists and geeks. If you haven’t already done so, sign up for the Startup Edmonton newsletter to keep up-to-date on future events (you can also join the Meetup group). See you at DemoCamp Edmonton 22!